SFP+ cable assemblies are built w/ the SFF-8431 spec connector, and are designed to interconnect a variety of common physical layer standards including 10 Gigabit Ethernet, Fibre Channel, SAS, and InfiniBand. The superior electromagnetic interference (EMI) girdle design ensures the industry’s lowest EMI interference. EEPROM feature enables the host to detect or configure specific performance characteristics. *Supports 10-Gigabit Ethernet and 10-Gigabit Infiniband standards. * Also supports 1, 2, 4, 8 and 10 Gb/s Fibre Channel applications. 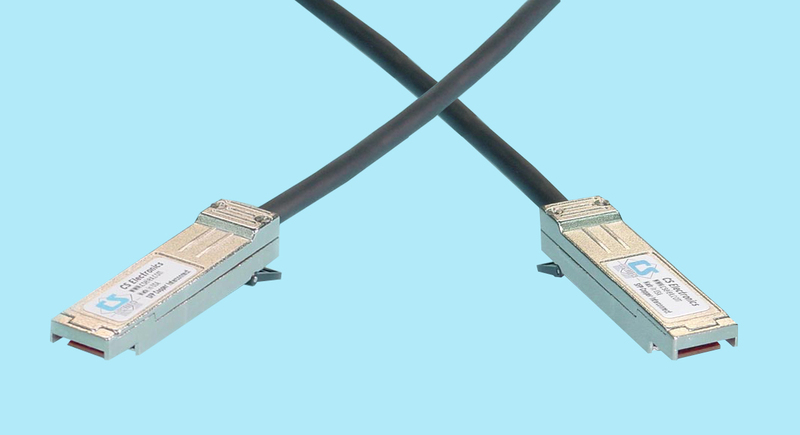 * Zinc die-cast SFP+ connectors reduce power and lower port cost compared to optical. *Conforms to SFF-8431 specifications. Compliant to the SFP+ MSA. CS Electronics has incorporated 12G HD Mini-SAS connectors, SFF-8644 (External), SFF-8643 (Internal) & the newly re-designed 12Gb/s rated drive connector, SFF-8680, into both 12G HD Mini-SAS Cables and on 12G HD Mini-SAS I/O & Drive adapters. We also have an extensive line of ‘hybrid’ cables utilizing SAS, MiniSAS, and 12G HD Mini-SAS connectors such as SFF-8644, SFF-8643, SFF-8088, SFF-8087, SFF-8470 in most any connector configuration and length option.